Although the banded Gila monster (Heloderma suspectum cinctum) is rarely encountered, it is one of the few venomous lizards of the world and should be approached with caution. 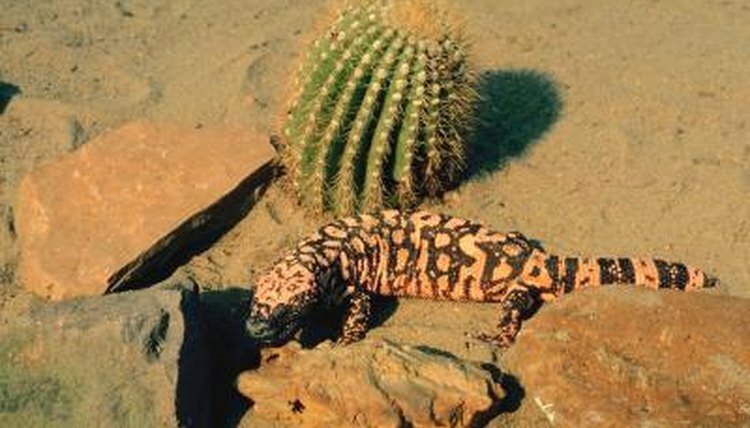 One two subspecies of Gila monster, it is characterized by pink or orange bands across a black body. Banded Gila monsters live mainly in western and southern Arizona and Sonora, Mexico. They can also be found in areas of California, Utah, New Mexico and Nevada and are specially adapted to survive harsh desert conditions. The banded Gila monster spends the majority of its time in burrows and under rocks. According to the Arizona-Sonora Desert Museum, up to 98 percent of a Gila monster's life is spent underground. When it emerges, its black-and-orange-banded pattern provides camouflage as it walks through the rocks and sand in its desert habitat, and its black eyes blend in with its body, making detection by predators less likely. The bright orange or pink coloring also serves as a warning to potential predators to stay away. Rounded scales cover the the Gila monsters body. The scales rest side by side and do not overlap. Small, bone-filled beads called osteoderms rest underneath the scales, resulting in the appearance of beaded skin. This provides an armored shield against predators and makes it more difficult for an enemy to sink its teeth into the Gila monster. Venom released when the banded Gila monster bites attacks the nervous system of prey and also serves as a defensive mechanism. Glands in the lower jaw release the venom into grooves in the Gila monster's teeth. When a Gila monster bites, it will generally hold the bite and chew more venom into its victim. While bites are generally not fatal to humans, they are painful and result in nausea, vomiting, bleeding and edema. Gila monsters have a low metabolism and spend most of their lives inactive in burrows. This large lizard reaches upt to 20 inches in length and is characterized by a large tail where it stores fat for nutrition. Gila monsters binge, consuming up to 35 percent of body weight in one meal. The ability of the lizard to store fat effectively means it only has to eat three or four meals per year to survive. Gila monsters enjoy a diet consisting of vertebrate eggs, rodents, baby birds, small mammals and even other lizards. Consuming large amounts of water is an adaptation that keeps Gila monsters hydrated in their dry, desert habitat. They drink up to 15 to 20 percent of their body weight in water at a single time. The Gila monster uses its urinary bladder as storage for this water. Water from the bladder can be reabsorbed into circulation when needed to prevent dehydration.